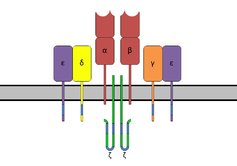 The T cell receptor complex with TCR-α and TCR-β chains (top), ζ-chain accessory molecules (bottom) and CD3 (represented by CD3γ, CD3δ and two CD3ε). In immunology, the CD3 (cluster of differentiation 3) T cell co-receptor helps to activate both the cytotoxic T cell (CD8+ naive T cells) and also T helper cells (CD4+ naive T cells). It consists of a protein complex and is composed of four distinct chains. In mammals, the complex contains a CD3γ chain, a CD3δ chain, and two CD3ε chains. These chains associate with the T-cell receptor (TCR) and the ζ-chain (zeta-chain) to generate an activation signal in T lymphocytes. The TCR, ζ-chain, and CD3 molecules together constitute the TCR complex. The CD3γ, CD3δ, and CD3ε chains are highly related cell-surface proteins of the immunoglobulin superfamily containing a single extracellular immunoglobulin domain. Containing aspartate residues, the transmembrane region of the CD3 chains is negatively charged, a characteristic that allows these chains to associate with the positively charged TCR chains. The intracellular tails of the CD3 molecules contain a single conserved motif known as an immunoreceptor tyrosine-based activation motif or ITAM for short, which is essential for the signaling capacity of the TCR. The intracellular tails of the ζ chain contain 3 ITAM motifs. Phosphorylation of the ITAM on CD3 renders the CD3 chain capable of binding an enzyme called ZAP70 (zeta associated protein), a kinase that is important in the signaling cascade of the T cell. Because CD3 is required for T cell activation, drugs (often monoclonal antibodies) that target it are being investigated as immunosuppressant therapies (e.g., otelixizumab) for type 1 diabetes and other autoimmune diseases. CD3 is initially expressed in the cytoplasm of pro-thymocytes, the stem cells from which T-cells arise in the thymus. The pro-thymocytes differentiate into common thymocytes, and then into medullary thymocytes, and it is at this latter stage that CD3 antigen begins to migrate to the cell membrane. The antigen is found bound to the membranes of all mature T-cells, and in virtually no other cell type, although it does appear to be present in small amounts in Purkinje cells. This high specificity, combined with the presence of CD3 at all stages of T-cell development, makes it a useful immunohistochemical marker for T-cells in tissue sections. The antigen remains present in almost all T-cell lymphomas and leukaemias, and can therefore be used to distinguish them from superficially similar B-cell and myeloid neoplasms. ^ Kuby J, Kindt TJ, Goldsby RA, Osborne BA (2007). Kuby Immunology. San Francisco: W.H. Freeman. ISBN 1-4292-0211-4. ^ Leong AS, Cooper K, Leong FJ (2003). Manual of Diagnostic Cytology (2nd ed.). Greenwich Medical Media, Ltd. pp. 63–64. ISBN 1-84110-100-1. Shiv P, Abul KA, Andrew W (2011). Cellular and Molecular Immunology: with STUDENT CONSULT Online Access. Philadelphia: Saunders. ISBN 1-4377-1528-1. This page was last edited on 27 October 2018, at 01:43 (UTC).